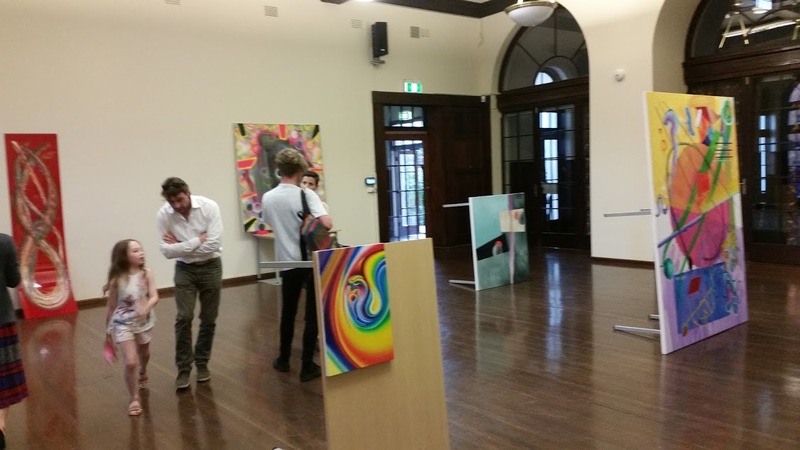 Eight Paintings in One Night: Lauren Beasley, James Thomson, Blake Malone, Soop, Joel Easson, Matthys Gerber, Elmo Aoyama and James Aksman-Glosz at the Bevery, Holme Building , The University of Sydney. 6pm Thursday 15th October 2015. Blake Malone Composition Nasa (front), James Aksman-Glosz, Ares III: Living and Dying in Fear of the Naked Sun (middle), James Thomson Candyland (back). Photograph Mark Roberts. Earlier this year a cafe shut down in Chatswood Plaza close to where I work (my day job that is). It has remained vacant ever since with a “to lease” sign stuck in the window. During the same period my local shopping centre has slowly shut down. Sometime over the next few months it will be demolished to make way for a new development. But by that time many of the shops and offices will have been empty for over a year. Surely these spaces could be put to some use during this period. They may not be economically viable for an ongoing commercial lease (or perhaps, in the case of the cafe in Chatswood, the rent is unsustainable, but couldn’t these spaces be repurposed for a few months? As they are mostly retail spaces they are unsuitable for short term accommodation for the homeless (though there maybe other spaces that are suitable) but there are many other uses that these spaces could be put to in the short term that would return some value to the community. Two that spring to mind would be temporary gallery spaces and artists and writing studios. Imagine that derelict building that has sat empty for a year because the developer went bankrupt full of artists studios and exhibition spaces – the building itself could become an artwork – a last burst of colour before it is knocked down. Such spaces would be, by definition temporary, transient spaces recorded on film, in words and in the artworks that were produced. Art as social history – who lived, worked and died in the building. There are lots of possibilities. There are, of course, numerous roadblocks to such a vision – commercial, planning, regulatory, safety and the like – but surely there would also be numerous benefits. An example of how easy it would be to set up a very temporary art exhibition space occurred last Thursday at Sydney University. 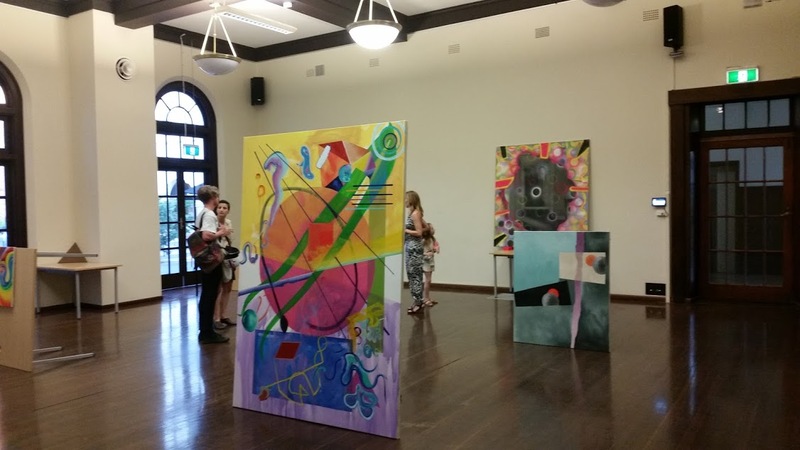 A temporary exhibition of eight paintings by eight artists was set up in a room in the Holme Building, one of the Buildings operated by the University of Sydney Union. The exhibition was organised by a group called MASS which describes itself as “a nomadic gallery that make use of alternative spaces for exhibiting”. MASS appear to have grown out of Sydney College of the Arts and still have a close relationship to the University of Sydney – hence the use of aq room in the Holme building for their one night exhibition. They do, however, state that they want to work “through shop-fronts, offices and warehouses and matching these to suitable artists to work with/in”, so perhaps we might hope to see some life in abandoned shop fronts yet. An interesting part of the 8 Paintings in 1 Night exhibition was that it didn’t feel like a ‘proper’ art exhibition. Works were leant up against the wall or upturned tables were used to lean larger canvasses up against. The result was refreshingly informal, you could actually walk around the backs of many of the works and see the wooden frames, the stretched canvasses – things that are normally hidden in a gallery exhibition. Each artist had a single work on display so there were eight works in all and as the works were spread throughout the room (ie not simply hung on walls) the space actually felt quite full. Walking back through the Quadrangle I wondered is MASS had stumbled over a model that could breath some life into doomed spaces and provide access to studio and exhibition space to artists and writers struggling to find outlets. Possibly – lets see if they can expand off campus and into the suburbs. Mark Roberts is a Sydney based writer and critic. He currently edits Rochfors Street review and has a collection of poetry, Concrete Flamingos, due for publication in 2016. This entry was posted in 8 Paintings in 1 Night, Issue 16, Mark Roberts, MASS and tagged Blake Malone, Elmo Aoyama, Holme Building, James Aksman-Glosz, James Thomson, Joel Easson, Lauren Beasley, Matthys Gerber, Soop, Sydney College of the Arts, Sydney University by Mark Roberts. Bookmark the permalink.